Collecting the values of the coordinates of any image is a common requirement in many applications. For example if we have one map and wants the visitors to click on any area of the map to enlarge ( zoom ) it then we must know the coordinates of the click point where the visitor wants to be magnified. Based on the coordinates in X and Y plot of the image we can further process the script to give desire result. 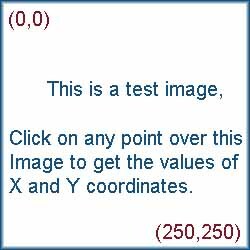 The example below will display the values of the coordinate ( X and Y ) of the point you click. Here by using CSS, your mouse pointer is changed to cross. You can learn more on how to change the mouse pointer in our CSS section or click here. Copy the code of this example given at the end. Note that the value of X ( horizontal ) and Y ( Vertical ) coordinate is zero at the top left corner of the image. It reaches its maximum value at the right bottom point of the image. <input type="image" alt=' Finding coordinates of an image' src="xy-coordinates.jpg"
This was so helpful and saved me a lot of time. Thanks a lot. How would i use this method if i wanted to have 2 images that i want to click before the form posts?